Last year in Lavo, Las Vegas on NYE Nicole Richie was pictured wearing an UH-MAZING gold sequin dress, as we now know this dress was indeed designed by Nicole Richie for her Winter Kate clothing line. The Winter Kate 'Nicole' dress comes in at $795 making it the most expensive item in the Winter Kate collection. Well I just couldn't believe my eyes today when walking through my city centre and I seen this stunning gold sequin dress hanging in the All Saints signature window display. 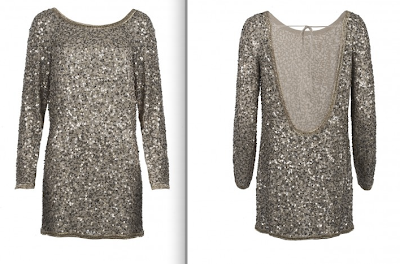 I would never condone buying imitations of Winter Kate as that's not cool, I think this is just purely coincidence that All Saints have designed a Gold sequin long sleeved shift dress with the same draped cowl back as the Winter Kate 'Nicole' dress. The above image doesn't do the colour justice, it is actually a really vibrant gold. Click Here to shop the All Saints 'Tavi' dress - £295.